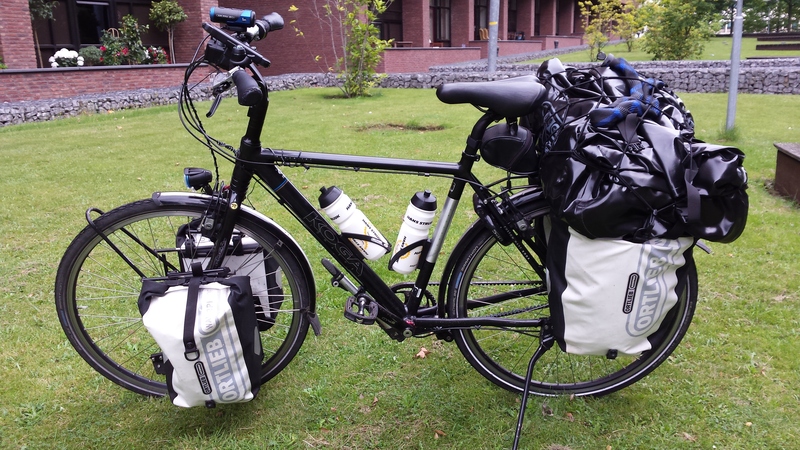 Packing list for my world cycle: done! Five weeks to go before I leave Eindhoven by bike, on the way to Australia. My apartment is looking bare. The boxes of my worldly possessions are ready for shipping to Australia. In a few weeks I’m having my early farewell party when friends can come and take things from my flat – mainly books and various odds and ends. The couple that will rent the flat after me are buying my furniture. That leaves a few possessions that can fit on my bike. I just had a look at your cross-continent plan to ride to Australia. It looks amazing. All the best for your journey. I look forward to following your travels on your blog. Went through your list. Looks very organised. What saddle are you using? I am using a WTB saddle on my touring bike and threw all my cycle shorts in the bin after my first few rides on it. I feel so much more comfortable and less cycley wearing my travel shorts (I have two pairds of zip of travel pants – one by Berghaus and the other by Mountain Designs). Not a criticism just a comment. Are you getting antsy to leave? I know I was when i was 5 weeks out I just left. Haha. Very naughty. Can’t wait to follow your adventures. I am getting eager to leave, but still have stuff to finish at work, and lots of stuff to finalise here before I leave (shipping my things to Australia, getting rid of my remaining possessions, as well as stuff related to the sustainable schools project that will be linked to my trip). Very nice bike my friend. I wish you really that you will have safe travels and as soon as I am online with my new page, I will allow myself to contact you for an interview… I did many trips in the past, like some crazy dude, who wanted to see the world – a bit more back to earth now and I know that it is not about me and my trips: it is about us and the different views that we all have. So I would like to share the trips from other people and collect the stories from all of us, to publish them under bike4peace.eu – my personal page, where I also published the images from my trips in India and Bangladesh or Nepal – of course also from my time in Europe. What you are going to do, this bike trip – it will change your life and I like to see that your bike is not tooo heavy packed and apart from all I love the color ! What a lovely comment! Where did you go in Bangladesh? That is a place that I have wanted to visit since I briefly touched down at Dhaka airport in 1993 on the way to Nepal. This time I will be cycling there! I will also be cycling through Greece. I’ll see some (or maybe a lot) of your beautiful country. I will be in Greece at that time. Please contact me then through FB and I will host you, when ever I can or my contacts allow me to do so. I keep my answer short with Bangladesh, because I am right now in Rhodes, the Island and I cycle today around, once around the Island – I guess it will need 3-4 days. I have some images from Dhaka and Khulna and some videos from Chittagong and Cox´s Bazar. I loved that country and as soon you are there, let me know. I traveled from India, Howrah to the border of Bangladesh. I entered then (I can not remember the border name, I will check that one time later) – and went to Satkhira and people from RISHILIPI helped me (Italien people who have an amazing NGO, see http://www.rishilpi.org/ ) – from there I went to Dhaka, by I had to take the Bus because at that time they had crazy demonstrations in the country ! I was lucky that I had the right people around me. But I do not want to put a bad light on the people there. When I see that I was 3 months in that country, I have to tell you the truth: I have never met sooooo nice people in my life again ! See this, if you like to watch the few images that I took. I did not had a camera… after I went by bike back to India (to cycle to Nepal) I got a Fuji x20, and from then I started to focus on images. Thanks for giving me the option to share this things with all of you. Peace and Out, much Sun and Love from Greece. hi Alesandros, and thanks for your long answer. The photos of Bangladesh are great. I really am looking forward to going there.. Ever since I was there briefly in 1993. Hi there! Amazing what you are doing! I wish you luck on your trip and if you pass Vienna and you need something, write me! Looking forward to read your travelblog! Hey Froukje. Thanks for your best wishes! I’m only passing very briefly through Austria, and not to the beautiful city of Vienna this time. Greetings from Schimmert in the Netherlands.